This story is part of a series featuring each of the fifteen startups in the CYstarters 2018 summer cohort. Each team has the opportunity to focus on their startup or business idea while receiving $6,500 or up to $13,000, along with mentorship, accountability, and educational sessions on how to build a business. 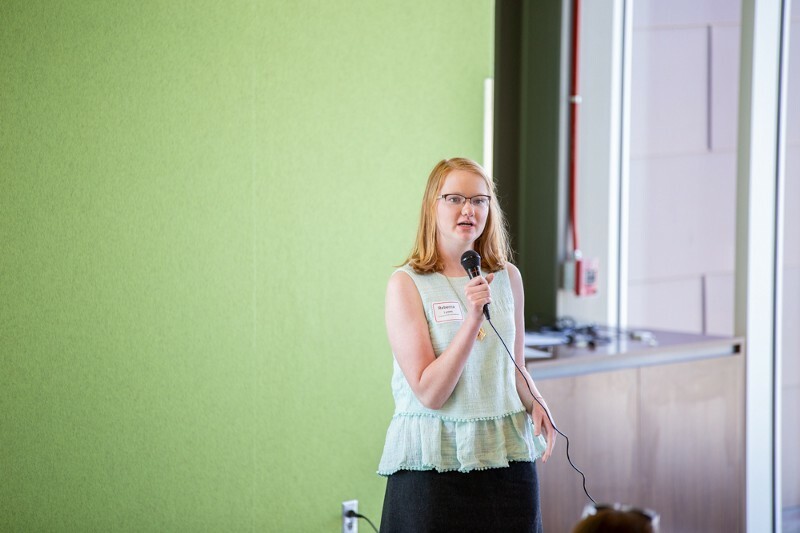 Lyons shared her business, LunchSox, to community supporters at the CYstarters’ Community 2018 Kick-Off event held at ISU Research Park, Core Facility on May 23, 2018. School: Senior at Iowa State University, studying agricultural studies, with a minor in entrepreneurial studies. Also pursuing a master’s degree in agricultural education. Growing up on a farm, Rebecca got to raise cattle and compete in 4-H, but most importantly, she learned the value of feeding her community. Fast forward to college, it is no coincidence that she found herself heavily involved in the agricultural community at Iowa State University. Combining her experience with farming and her newfound passion for entrepreneurship, Lunchsox was born. Lunchsox sells socks through its online store and partners with retailers to provide lunches for kids in need by donating 100% of the profit to partnering meal programs. She is currently transitioning her business from purchasing socks at wholesale to a “farm to feet” model which sources 100% of the materials from the United States and is completely transparent about the entire manufacturing process. When Rebecca is not running her own business or being a normal college student, she also serves as the marketing coordinator for KinoSol (a member of the first CYstarters cohort in 2016). KinoSol provides food dehydrators to help reduce food waste, specifically in poverty-stricken areas in Africa. Rebecca has a heart for making a difference in the world, and Lunchsox is a perfect way to have a positive impact both locally and globally. 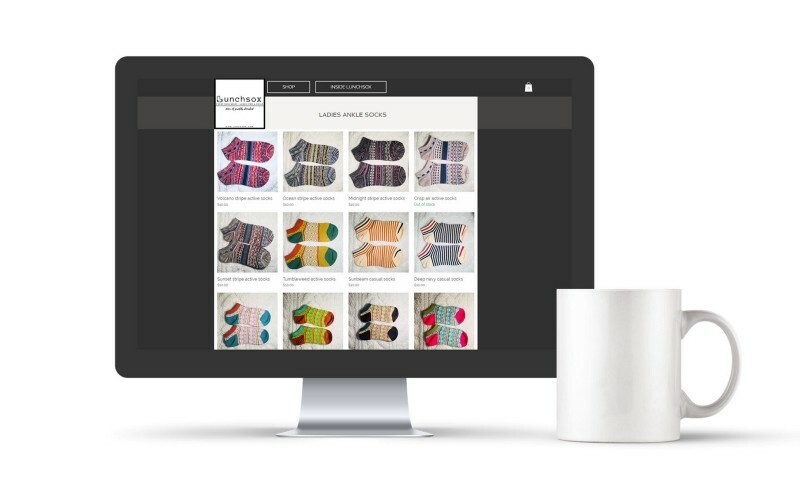 Recently we caught up with Rebecca to see how CYstarters has had an impact on LunchSox. We do offer both men and women’s socks, but my average customer is a middle-aged woman, either buying for herself or as a gift. As I transition into the more “farm to feet” business model, I can see my customers turning more into those who are conscious about where their products come from. Providing complete transparency about the entire process is very important to me, and my customers. What part of your business actually goes to providing lunches? 100% of my profits go towards providing lunches. Right now, my business is operating on a one-to-one model where each pair of socks provides one lunch. As my business grows, and my margins increase, I will be able to provide more lunches per pair of socks sold. Lyons models off Lunchsox at the Technori Dubuque event on June 14th. Where do you provide and donate lunches? The first year of business, I donated all my profits to an organization called Life to Life Africa in Zimbabwe, which provided meals for preschool-aged orphans. I had worked with them last summer, so having the connection with that organization made it simple to execute. My customers are local and buy local, so they would like the lunches to stay local. Because of this, in the year 2018, I am donating all of my profits to the BackPack Buddy weekend meal program in my hometown of Clinton, Iowa. Long term, we will expand our donation options, and give the buyer the ability to pick a meal program where they like to donate. Advice for aspiring Iowa State entrepreneurs? Just do it! As a student, everyone is rooting for you, and you have so many resources at Iowa State. It can be a little difficult to balance school and starting your own business, but just do it, because you have nothing to lose! What are your goals this summer, and going forward? By the end of CYstarters, I want to have my supply chain ironed out. In 2019, I want to have an efficient meal distribution model figured out. I also would like to have my own sheep someday. I could use them in my marketing material, use their wool for production, and for enjoyment! Eventually, I would like to provide my own wool, instead of sourcing from farmers. Also, my team will need to grow at some point, and I want to hire those who have traditional barriers to employment. How can others help you? I am still making relationships with sheep farmers, sock manufacturers, and fashion professionals, so if you know of anyone in that industry that might be interested in partnering, with me, that would be great. Lastly, buy socks! Use the promo code CYSTARTERS to receive 25% off your first order. Click here to order your first pair of Lunchsox! How should others find and connect with you? You can find Lunchsox at lunchsox.com. You can contact me through the website or our Facebook and Instagram.